Q: How does the height at which water droplets fall affect DBPs during the spray aeration process? In general, the greater the distance a droplets falls, the more time there is for THMs to diffuse out of the droplet into the air, and the more effective the THM removal. Ethan Brooke, who leads our in-tank aeration design team, has published research showing the relationship between droplet height, size and THM removal. But in cases where there is restricted headspace, spray systems can still be effective – mainly by changing the type of nozzle used and the hydraulics of the system. Q: Can an in-tank aeration system be operated during the winter? Yes. Spray systems turn over A LOT of water, and this prevents freezing (even when outside temperatures are well below freezing). Some operators choose to turn their systems off in the winter, and our in-tank aeration systems allow this to be done safely without risking any damage to the system. Q: In an unmixed tank, won’t chlorine levels drop at the top of the water surface and stop DBP formation? Yes and no. If you lose all of your chlorine residual in the top water layer of your tank, you won’t have any disinfectant to react with organic matter in the water –THM formation will stop. However, once you lose residual, biofilms can proliferate and increase the concentration of organic material in the water. When new water enters the tank, the chlorine in this new water will react with the biofilms resulting in a rapid loss of disinfectant residual and a spike in DBP levels in the tank. 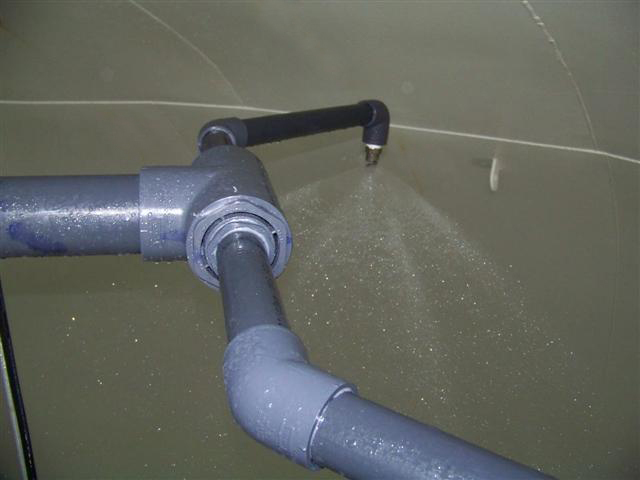 Q: How does the installation of an aeration system differ between ground storage tanks versus elevated storage tanks? Typically, elevated tanks are a big challenge for contractors – they’re often working with very tall tanks and heavy cranes, and it’s expensive to maneuver large pieces of equipment in the air. Some aeration equipment on the market is bulky and getting this equipment inside a tall tank is a challenge. Ground storage tanks have an advantage because you can generally service them with a ladder or a lift truck. For this reason, aeration systems that use less equipment and are more streamlined are better suited for elevated tanks. Q: Does the tank have to have forced ventilation when you install an aeration system? Ventilation is critical for in-tank aeration to be successful. Without adequate ventilation, THMs will build up in the tank headspace until they reach equilibrium with the water, and no more THM removal is possible.